The Lady Harvesters defeated Mountain View on Oct. 9. As an opposing serve arches over the net toward Kalli Caddell’s side, the freshman setter moves into position. The squeaking of shoes echoes throughout the Eastfield gym as the volleyball team practices against one another. Caddell anxiously taps her fingers on her thighs, anticipating her teammates next move. A teammate digs the ball and Caddell reads its flight before moving to set the ball for a hitter to attack to the other side. Caddell said her role as the team’s setter has her actively participating in the buildup of plays. Over the course of this season, she has distributed 644 assists to her teammates, nearly two-thirds of Eastfield’s entire team tally of 973. The team is ranked No. 3 in the nation and continues its undefeated run in conference (7-0). Her recent performances earned her the National Junior College Athletic Association’s Division III Player of the Week award for Sept. 25-Oct. 4. In that time span, she had 134 assists and 39 digs. Eastfield coach Brandon Crisp said setters like Caddell keep the offense ticking smoothly, like a quarterback in football. 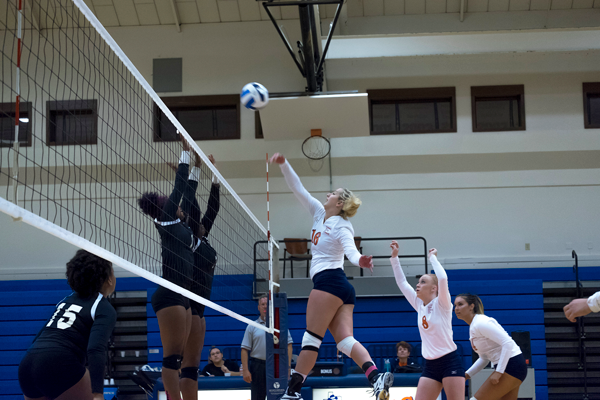 Caddell said she knows the importance of her position on the team, even though the average fan may not quite appreciate a setter’s responsibilities. “We have great hitters and the passers just dig these great balls up, but sometimes the in-between thing is kind of unseen,” she said. However, the Harvesters have reaped the benefits from Caddell’s play and Eastfield has continued their overall dominance. Outside hitter Kirsten Fredrickson won two consecutive Metro Athletic Conference Player of the Week awards, for Sept. 24-30 and Oct. 1-7. In that time, she made 54 kills, with many assists coming from Caddell. She is second on the team with 244 kills this season. Outside hitter Keishla Reyes, who leads the team in kills, 272, said Caddell plays in a smart and efficient manner on the court, heavily influencing the team’s entire game play. “She thinks and she visualizes what she’s going to do and what should happen before she actually runs the play,” Reyes said. Reyes described Caddell as an aggressive and hardworking player and a “mom” figure in the team.